Have you ever stopped to think about the phrasing of this verse? Have you wondered why Jesus used the words "lay down one's life' or "to give one's life" rather than just simply use the words to die? Jesus is about to physically lay down his life, to die, for those whom he loves, mankind, us. But physical death is not the only manner of laying down one's life, of giving one's life for another. Jesus gave us this example not just in his death but also in his life. He died for us, yes, but he also lived his entire life for us. Dedicating his life for us, giving up his own wants and desires for us, for our benefit, for our sake. In the preceding verse, Jn 15:12, Jesus says "This is my commandment: love one another as I love you". We are commanded not only to love, but to love as Jesus loved. All Christians are called to love to the point of "laying down our lives" for the sake of those whom we love. This is the command that we obey for the sake of others. We are called to love them, to lay down our lives, to actually LIVE our lives for their benefit. No matter how many days, weeks, months, or years this may involve we are called to lay down each of these days, weeks, months, years for the salvation of others. To give our wants, needs, desires and future for this purpose. When we do this we can be assured of a promise that Jesus made. In verse 14 Jesus says "You are my friends if you do what I command". In responding to this call to lay down our lives we receive the profound privilege of a friendship with Jesus. In reality, although the manner in which we lay down our lives is to love one another, the friend for whom we truly lay down our lives is Jesus our Lord. We follow his example in that his love for us stems from and is an expression of his love for the Father, so to does our love stem from and is an expression of our love for him. Be assured as we seek to respond to this call to do what he commands, no matter when, how or even if this bears fruit...Jesus will call us Friend. Jesus showed us how to love. He showed us in his life, he showed us in his suffering, he showed us in his death. In the end he showed us the greatest act of love, the most profound manner of laying down our lives and that was forgiveness. Forgiveness is the greatest act of dying to self. For in forgiveness we give up our rights. We give up our right to be angry, we give up our right to be hurt, we give up our right to receive repayment of wrongs done to us. We give up our own satisfaction, our own desire to have our feelings matter. We die to every urge of human nature to put ourselves and our needs first and instead look to those who have hurt us and offer the benefits of reconciliation and resurrection. This is the true nature of forgiveness. I have not had the chance to tell much of my personal story on this blog. For now I will just share that after 23 years my husband left our marriage in 1999 and obtained a civil divorce in 2002. I have felt called to remain faithful to my own marriage vows in the face of this circumstance. For almost 14 years this decision has been reinforced and upheld rather than abating over time so that I feel fairly certain that this stand is one that I am supposed to take. The Lord has spoken to me often about what my attitude should be toward my husband. I have felt the Lord telling me that I am not the watchdog of my husband's behavior and that any accountability on my husband's part is for God to determine and not me. I have been asked to attach no conditions, to set no boundaries, or limitations. This is hard for some to accept for it makes it appear that my husband has gotten away with some things and that I am willing to live with continued mistreatment. But this is not so. I know what I risk when each day I wipe the slate clean regarding my husband without requiring change before hand. God, too, knows what he is asking of me. But God has also asked me to trust him and his purpose in this. forgiveness is unconditional and freely offered to us at every moment. It exists outside of any action of ours. The proper response to this freely offered gift is to turn around and receive it. condition, it is a response. But even if you do not turn around it does not change the fact that God is standing there with his arms outstretched and open, he is still forgiving and has forgiven but we have refused the offering. When we refuse to turn around we then face the consequences of our choice and that is to place ourselves in a life outside of God's forgiveness. Even though allowing us to suffer the consequences of this choice, God continues to stand with his arms outstretched and open, forgiving. Regardless of merit, before and independent of repentance, forgiveness if offered and repentance is only the response to the forgiveness that is eternally offered. consequences of their refusal to accept what is offered is not up to us to determine. When we forgive we also demonstrate our complete trust in God to determine what actions require what consequences. When we forgive we are in reality saying, that we give up any supposed right to require repayment from our debtors and leave in God's hands whether or not a consequence will be faced. Forgiveness on our part demonstrates obedience, trust and the relinquishing to God what is his to determine. We tend to offer forgiveness but usually with conditions. We want to see repentance come first. We want the person to be sorry, remorseful and then we will forgive. We want to be well treated afterwards. But this is not a true picture of forgiveness it is more a picture of personal vindication. You know when you forgive a debt, you wipe it out and it is as if it never existed. Jesus said that we must forgive 70x7. We forgive today, we get up in the morning tomorrow and we forgive. We wake up each day and say we forgive this debt, we drop these charges, we wipe this slate clean. What has happened before this no longer exists. Each day, every day. We relinquish any right to retribution or accountability. We will never mention it again for it is no longer so. Our Father in heaven has already forgiven those who hurt us though they do not yet know it. They sometimes stay away, refuse to turn around, believing that they have a debt to repay to God and to us and it is too big for them. It is too great. That is why God needs for me to stand for someone like my husband, so that he can physically see this quality of unconditional love and forgiveness. But we have to be willing to love as God loves and to forgive as God forgives in order to demonstrate this for others. You know, I really began to understand God's love for me when I began to see his forgiveness of my husband. I began to understand and have faith in God’s love for me because I saw that God loved my husband enough to pursue him and to forgive him even before he returned. God's love for my husband is so great that he has asked me to take this stand for him. God's love for my husband is so great that God inspires me to pray and ask for prayer for him. God's love for my husband is so great that he is putting all of these things into place to restore my husband to himself. 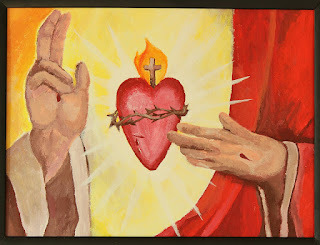 I have the privilege of participating in a direct act of love and mercy at the hand of God. I have been given an opportunity to mirror Christ to one person who may not be able to see him otherwise. I have been granted such a profound and wonderful opportunity. No matter what happens, even if my husband continues to reject it, even if he does not turn around and receive it, I will always know and be grateful that I was allowed to be a part of such an astounding act of love and mercy. I am honored by it, I am humbled by it. By experiencing it I have been given a deeply profound and personal understanding of God’s love for me and for all.